By: Erik Hyrkas on January 23, 2018. 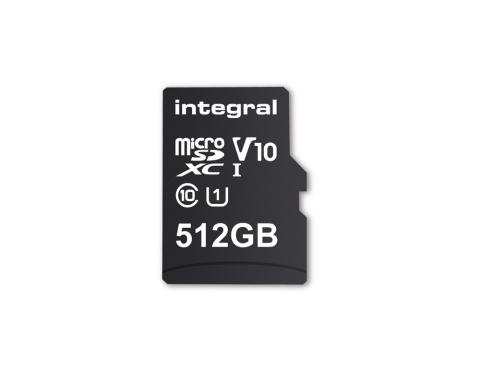 Large-capacity micro storage has been a big deal the past several years, and Integral Memory has just taken it a step further with the first 512GB MicroSD card. The world record feat beat’s SanDisk‘s most recent 400GB card (it’s $250). The card plants an incredible tangible punch in storage size, putting half a terabyte of storage in something the size of dime. While Integral Memory is taking the record on size, it’s still a bit slower than SanDisk’s write speed of 80MB/S rather than 100MB/S. Nevertheless, this card meets the V10 UHS-I Class 1 standard for video storage cards, making it practical for use in HD cameras, action cameras, and drones. 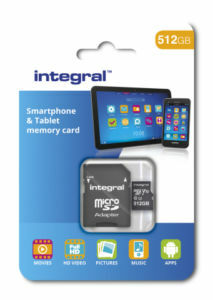 Of course, you can also use this in your Android smartphones with expandable storage, making it an impressive external storage tool. The card will be available for purchase in February and no price is set. 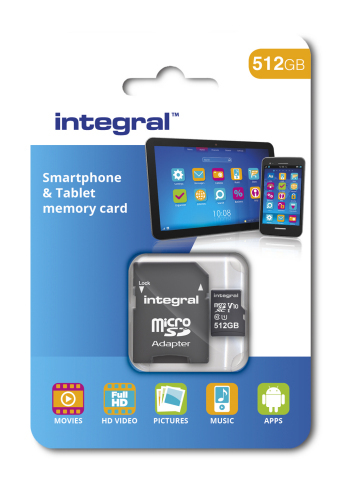 Integral is a European based company and has partnerships with Toshiba, Samsung, and Hynix. Last updated by Erik Hyrkas at February 11, 2018 .